According to this story, there is to be a “soon to open” Robinson’s Place Calbayog. Anyone know anything about that other than what you read here? 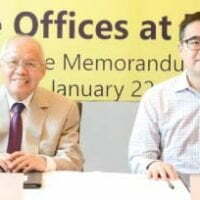 Robinsons Land Corporation (RLC), has further strengthened its partnership with Social Security System (SSS) by signing a Memorandum of Agreement (supplement) which reaffirms its participation in Robinsons Malls Lingkod Pinoy Center. A formal signing of the agreement was recently held led by RLC President Frederick D. Go (third from left) with SSS President and CEO Emmanuel F. Dooc (second from left), together with RLC Commercial Centers Division SVP and General Manager Arlene G. Magtibay and SSS Senior Vice President and Chief Legal Counsel Voltaire P. Agas. The partnership between RLC and SSS started on April 2012 with the signing of the original Memorandum of Agreement (MOA) with a term of three years. During the term of this MOA, SSS was able to open 25 SSS Members Assistance Desks which offered the following services: SSS forms issuance; receiving of applications for membership, benefits and loans; receiving of contributions and loan collection lists, issuance of SSS number for employees and self-employed; and status verification of membership, contribution, salary loan and claims. In 2015, the MOA was renewed for five years where RLC offered six additional Robinsons Mall sites for SSS to open more SSS Members Assistance Desks. kailan mg start ang construction ng robinsons calbayog? I don’t know, but I wish they would hurry up. Their supposed location is better for us than Gaisano Mall or Metro Supermarket. We’d probably be doing all our grocery shopping and mall shopping there. Plus Robinson’s should have a KFC and Shakey’s inside of them.